A beautiful walnut music box. An exquisite musical box made by Reuge in Switzerland. 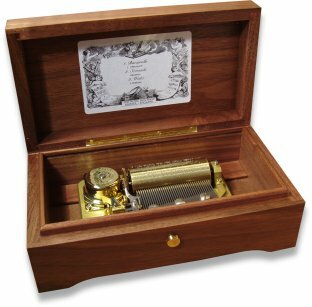 This very traditional walnut music box has a 36 note movement playing 3 tunes. The movement is under glass and the box is finished in a natural satin lacquer. 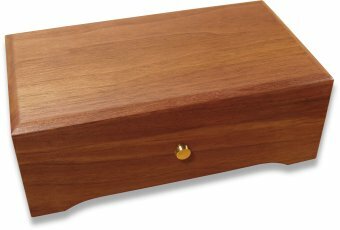 This musical box is wound by a key from underneath. The mechanism is operated from a slide button on the front of the box, which enables you to play the music with the lid open or closed.